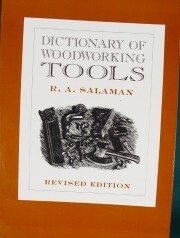 USED BOOK Dictionary of Woodworking Tools by R. A. Salaman. The definitive guide, covering American plane makers from the earliest individual makers who worked before the Revolutionary War to the last few manufactures of the twentieth century. This comprehensive directory includes nearly 2,000 biographical entries, together with over 2,200 imprint illustrations and wedge outlines. The most comprehensive book on American wooden plane makers. 462 pages and over 3,000 illustrations. 7" x 10". Soft bound. From much interest generated by Mr. Copes two previos books, American Machist's Tools and Makers of American Machinist's Tools, this new volume of More Makers of American Machinist's Tools resulted. Hundreds of additional makers are covered. Included, as well, are hundreds of additional indexed and tool patents, illustrated, providing more assistance in identifying and categorizing tools. 7' x 10". Soft cover. This is a fabulous book. Salaman describes and illustrates just about every tool in the leather working trade. Covered are tools for the Bookbinder, Boot and Shoe Maker, Furrier, Glove Maker, handbag and Purse Maker, Harness and Saddle Maker, Hat Maker and more. There are chapters on leather manufacture and on tools for the decoration of leather. 377 pages Fully illustrated. 8" x 10". Hard cover. "Pewter In America, Its Makers and Their Marks", THREE VOLUMES IN ONE, by Ledlie Irwin Laughlin. 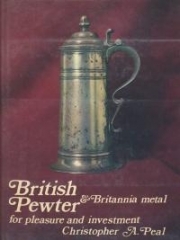 "Pewter In America, Its Makers and Their Marks", THREE VOLUMES IN ONE, by Ledlie Irwin Laughlin. OUT OF PRINT. USED BOOK - As new condition.The amount of information gathered in this book is amazing. An invaluable volume sought after by collectors and dealers alike. Pewter in America is the fascinating story of American pewter, told with loads of detail and hundreds of illustrations. Originally published in 1940, Vols. 1 and 11 were later reprinted together with the author's corrections and notes. Vol 111, first published in 1970 adds all the information discovered after 1940 on pewter, its makers, and their marks. 11 1/4 x 8 3/4. Hard Cover. USED BOOK This books is Out of Print Some 19th Century English Woodworking Tools, Edge and Joiner Tools and Bit Braces. by Kenneth D. Roberts. Published 1980 by Ken Roberts Publishing Co. 1 Copy available Some 19th Century English Woodworking Tools, Edge and Joiner Tools and Bit Braces. The book is divided into six chapters beginning with the steel industry in Sheffield, on to the making of Saws and Files, with list of saw makers. Edge Tools, with list of Sheffield Edge tools makers and firms. Joiner's tools and list of Joiner tool manufacturers. Planes, and Braces and Bits with lists of Sheffield and Birmingham Brace and Bit manufacturers. Illustrated with photographs and detailed line drawings, the book is an outstanding source of history and information meticulously compiled by Mr. Roberts. 480 pages. Hard Bound. Used in excellent condition. 11 1/4" by 9". This copy was signed by the author on Nov. 1st, 1980. It came from the personal library of well known tool collector, the late Dr. Ronald Pearson. The book is number 93 of 750 copies and inscribed to Ronald W. Pearson. THIS BOOK IS OUT OF PRINT NEW CONDITION "The Ultimate Brace, A Unique Product of Victorian Sheffield" by Reg Eaton. Out of Print. 1 Copy available Tools made and marked "Sheffield" were known for quality and generations of trades people revered the name. This book is dedicated to one of those Sheffield tools - the Metallic Framed Brace, from the very beginning in mid 19th century to its end about 50 years later. Durring this time there occurred many variations and innovations which are meticulously detailed and illustrated along with manufacturing techniques used at that time. Some of the many questionable trading practices are explored along with Patent and Registration Designs which were openly copied and falsely claimed. Mr Eaton, one of the best known dealers in antique wood working tools, made Metallic Framed Braces his specialty. His personal collection of these braces is unrivaled as is his knowledge of them. 180 pages. 8 1/2" x 10 1/2". Hard Cover. 1989 Edition.